We left Narooma on Sunday morning, with the view of making it to Abercrombie River NP by evening. After a stop at Surf Beach to catch up with my mum and dad and to wish mum a happy 91st birthday for next month we were back up the Clyde and on the road to Goulburn by early afternoon. The road through to Oberon is almost all sealed except for a few patches of bone shattering coregations. We reached our destination at Bummaroo Ford (camps no 430) around 4 o’clock and were lulled to sleep by the sounds of Powerful Owls calling down the valley. Where we stopped for a cuppa and to our delight found that the rest area loos also has hot showers, does it get any better? 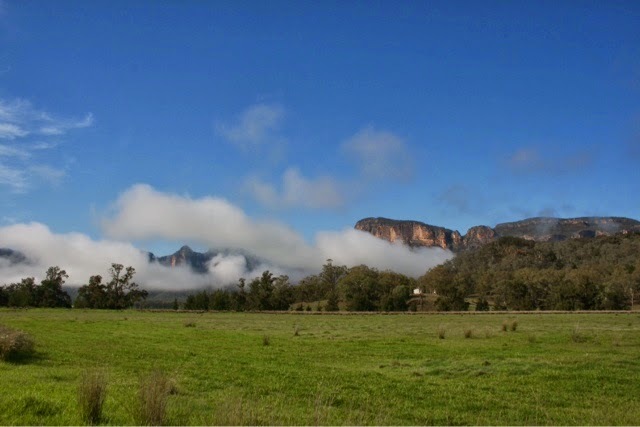 Our next stop was the birding mecca of NSW the Capertee Valley. This beautiful valley is largest enclosed valley in the world and the home of the elusive Regent Honeyeater. We camped at Glen Davis (camps 381), a community run site. A great spot, run on the honesty box – donation. Our only neighbours were a couple of twitchers, looking to tick of the Honeyeater. Posting this on the road north of Grafton it’s raining so we have decided to leave the coast and find some fine weather.